The Australian Terrier was developed as a working farm terrier to control vermin such as rats, rabbits, and poisonous snakes. They are fearless against serpents, dispatching them in a leap and twist attack from behind. Today the Australian Terrier primarily lives out a less thrilling life as a companion and show dog. They were the first Australian breed to receive international recognition by The Kennel Club in 1933. The Australian Terrier was developed from European terriers brought by early settlers to Australia. These dogs would have not been a specific breed, but rather general terriers bred to dispatch vermin. In Europe they were used to kill rats or bolt foxes when they went to ground. But in Australia where poisonous snakes reside they became adept at exterminating a new, deadlier prey. Actual breeds arrived in Australia during the first half of the 1800s where they would breed with the already present dogs. With so few terriers on the continent all were interbred, despite their previous pedigrees. However, by 1820 a deliberate breeding program was formed to create a dog suited specifically for Australia. Which dogs were used in this program are unknown. Most works state the extinct Black and Tan Terrier as their primary ancestor, although these dogs were more a type rather than a breed. Other suggestions include the Scotch, Paisley, and Fell Terriers. The Scotch would later be divided into the Cairn, Dandie Dinmont, Scottish, Skye, and West Highland White Terriers. The Paisley would develop further into the Yorkshire Terrier. Lastly, the Fell, which is a type rather than a breed, would give rise to the Lakeland and Patterdale Terriers. To confuse things further the Black and Tan is also considered by some authors to be a Fell. Other ‘modern’ breeds may be listed by some sources. In reality these breeds were either still being developed themselves or fall into the types above. Regardless of where it came from, we know the breed was firmly established by the end of the 1870s. However, particularly in Sydney, the Australian Terrier, Yorkshire Terrier, and Australian Silky Terrier would continue to be interbred for the several decades. Dogs from the same litter would be registered as different breeds depending on their coats. By the early 1900s the Yorkshire Terrier would become a distinct breed. 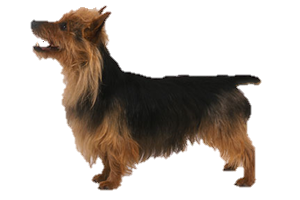 The Australian Terrier and Silky Terrier would not be separated until the 1930s, with the cross breeding formally discouraged in 1932. Is the Australian Terrier Right for You?